Michael Cusack was born on 20 September 1847 to Irish speaking parents in Carran, Co. Clare, at the height of the Famine. He lived in a small cottage with his parents, four brothers and one sister. Little is know of his childhood. On Sundays after Mass, Cusack and the other boys in the parish hurled and took part in athletics. He grew up in a home and in an area where Irish was still the language of daily life. He was probably eleven years old before he first used English and he quickly mastered it and to the end of his life he remained bilingual. He attended Carron National School when it opened in 1858. Cusack himself was a fine athlete and shot-putt champion. He became a teacher and travelled throughout Ireland teaching in Enniscorthy, St Colman's College, Corofin, Lough Cultra, Newry, Blackrock College, Clongowes Wood and Kilkenny College before eventually settling in Dublin. In 1877, he established his own Civil Service Academy, 'Cusack's Academy' in Dublin which proved successful in preparing pupils for the civil service examinations. As sporting journalism and politics eventually absorbed him, his teaching career receded into the background. In 1881 he criticised the administration of rugby and athletics in Ireland, suggesting that the organisers allow for a ‘strip of green across their colours’. Jumping and weight throwing he regarded as traditional Irish events; racing and cycling were dismissed as English importations. ​Cusack did not approve of how sports were controlled at that time. Firstly, those in charge of organized sports did not approve of games being played on Sundays. This was the only day of the week that rural people had free to enjoy sports. Also, organized games were quite elitist, excluding people who worked in manual jobs like labourers, mechanics and small farmers. Cusack was also concerned that the traditional Irish games of hurling and Gaelic football were falling into decline. ​Two forms of hurling had traditionally been played in Ireland - in the north and the west the game was played in the winter and resembled shinty; in the south and as it was a summer game with a broad-bossed stick as a t present. Cusack sided for summer hurling. In the early 1880s Cusack turned his attentions to indigenous Irish sports. In 1882 he attended the first meeting of the Dublin Hurling Club, formed ‘for the purpose of taking steps to re-establish the national game of hurling’. The weekly games of hurling, in the Phoenix Park, became so popular that, in 1883, Cusack had sufficient numbers to found ‘Cusack’s Academy Hurling Club’ which, in turn, led to the establishment of the Metropolitan Hurling Club. On Easter Monday 1884 the Metropolitans played Killiomor, in Galway. The game had to be stopped on numerous occasions as the two teams were playing to different rules. It was this clash of styles that convinced Cusack that not only did the rules of the games need to be standardised but that a body must be established to govern Irish sports. Cusack was also a journalist and he used the nationalist press of the day to further his cause for the creation of a body to organise and govern athletics in Ireland. On October 11 1884 an article, written by Cusack, called ‘A Word about Irish Athletics’ appeared in the United Ireland and The Irishman. These articles were supported a week later by a letter from Maurice Davin, one of three Tipperary brothers, who had dominated athletics for over a decade and who gave his full support to the October 11 articles. A week later Cusack submitted a signed letter to both papers announcing that a meeting would take place in Hayes’s Commercial Hotel, Thurles on November 1 1884. On 1 November 1884, Cusack together with Maurice Davin, of Carrick-on-Suir, Co. Tipperary, called a meeting in Hayes' Commercial Hotel, Thurles, Co. Tipperary, and founded the Gaelic Athletic Association (GAA). Davin was elected president and Cusack became its first secretary. Later, Archbishop Thomas William Croke, Archbishop of Cashel & Emly, Michael Davitt and Charles Stewart Parnell became patrons. The aim of the G.A.A. was to revive hurling and football and to obtain control over athletics. Although for a time it appeared to be suspended by a slender thread, the decision to base clubs on the parish and representative teams on the county fitted in precisely with local patriotism and led to the association becoming a mass movement. Four games were named on the original GAA charter back in 1884: Hurling, Gaelic Football, Handball and Rounders. Wresting control of a considerable sector of Irish sport from the hands of the establishment was a stunning feat. The ‘ban’, which came a year later prohibiting GAA members form playing or watching ‘foreign’ games (rugby, soccer, hockey or cricket), originated as a split in Irish athletics. This ‘ban’, which was revoked in 1971, long outlasted the conditions which gave rise to it. ​Certainly within the first few months of the organisation Cusack proved to be an excellent organiser. He did not however, continue to run the association for long after its foundation. Within eighteen months he was obliged to resign as a result of his failure to submit accounts for auditing. ​Cusack was also involved in a move to restore the Irish language and he was editor of the weekly newspaper United Ireland. He also founded (and edited) The Celtic Times, a weekly newspaper dedicated to 'native games' and athletics and to Irish culture in general. Cusack was a colourful character and his manner, dress and general deportment made him impossible to ignore. He was the model for ‘the Citizen’ in James Joyce’s Ulysses. Cusack died in Dublin on 27 November 1906 at the age of 59, and is buried in Glasnevin Cemetery, Dublin. His legacy can be seen in every village and town in the country in the form of GAA clubs which are still going strong. There are over 1,600 clubs in Ireland. There are also clubs in the UK, USA, Australia and many other countries across the world. ​From a remote, rural homestead in Carron to cities and countries across the globe, the GAA is now recognized as an international symbol of Ireland and its sporting traditions. Click HERE to watch and listen to Breandán Ó hEithir taking a look at the life of Michael Cusack from the RTE Archives broadcast on 27 November 1976. Click HERE to view the Papers of Michael Cusack Online Exhibition at NUI Galway. 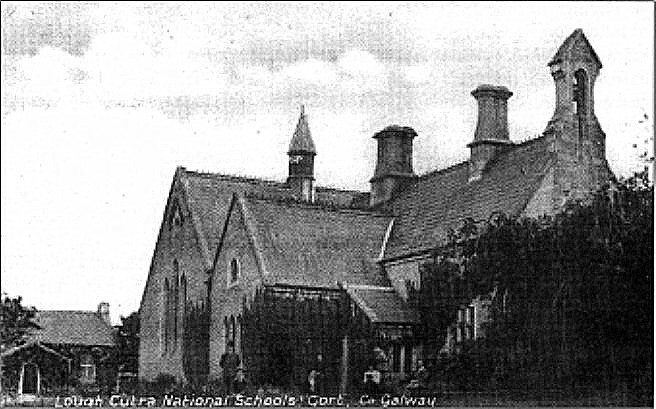 On New Years Day 1867, Lord Gough the local landlord, opened Lough Cutra School and appointed Michael Cusack as the first headmaster, a young man only 20 years old. He became Senior Monitor in Carron school. Before long, he was singled out by the school inspector as being the most promising monitor in the district, and recommended as a pupil teacher for Enniscorthy District Model School in Dublin. The Model Schools were not recognised by the Catholic hierarchy (which ran the vast majority of national schools) and priests were instructed not to employ teachers trained in these places. Nevertheless, Cusack took up his appointment at Lough Cutra with little or no trouble. Cusack's starting salary was £18 supplemented by weekly fees from students. It was increased to £32 with fees of £12 per annum in 1868. In March 1867, he employed his 14 year old brother Thomas as an unpaid monitor at Lough Cutra. The following year he was paid the fine salary of £6. Little is known about Cusack's stay in Beagh, but it appears he lodged locally, staying at one stage in O'Neills in Croaghrim, the school residence having not yet being built. It is said he walked from Carron to Lough Cutra every Monday morning and made the return journey each Friday evening. According to local folklore 'he was a very fine master and used to go bowling with the young men on Sundays'. While in the area, Cusack became friends with Ned Treston and Daniel Burke and often accompanied them to local hurling games. Cusack's time in Lough Cutra was brief - by 1871 he left to take up the position of Master of English and Mathematics in St. Colman's School, Newry, Co. Down.